Another of the films that was up for Best Picture this year, Hell or High Water tells the story of two brothers (Chris Pine and Ben Foster) who set out to rob some banks, but are being tracked by soon to be retired Texas Ranger Jeff Bridges. Tanner (Foster) is a career criminal, and recently released from prison. Toby (Pine) is the “good” brother but he teams up with Tanner to rob a series of banks to pay off the various liens against their family farm, monies owed to the very same bank chain they are robbing. On the side of the law is Marcus Hamilton (Bridges) a cranky, old Texas Ranger who delights in the chase almost as much as he does insulting his half-Comanche, half-Mexican partner Alberto Parker (Gil Birmingham) with as many racial stereotypes and slurs as he can think of. Despite this, Hamilton is a good cop and good at his job, soon he and Alberto are on the trail of a pair of mysterious bank robbers. The bank robbing brothers are also good at their job, laundering their money in a casino across state lines but each robbery gets more and more dangerous as the take, the stakes and the violence all increase. This was a very good heist movie (which I always enjoy) and it had a good dramatic core story. Hell or High Water was very well acted, and Jeff Bridges was nominated for a Best Supporting Actor Oscar. His character was humourous, intelligent, and a great foil to the violent, and erratic Tanner. Toby was also a great character, and also a clever opposite to his brother. Though their reasons are leaning towards noble, the brothers’ methods certainly are not, but it does make the whole film a little grey, at times I didn’t really know who to root for. At times I wanted the brothers to get caught (they were the “bad guys” after all) and at others I really wanted to see them get away with their scheme, and beat the bank. The film did a really good job showing the poverty and the emptiness in those small Texas towns, which also kind of helped feed the conflicted feelings I had towards the robbers and the banks. Full of action, full of drama, brimming with interesting characters, dark humour, and an engaging purpose behind the plot. I really had a good time with this film! Bottom Line: Remember how I questioned how Michelle Williams could be nominated for Best Supporting Actress with minimal screen time? Jeff Bridges’ nomination made perfect sense to me, because he was in roughly half the film. 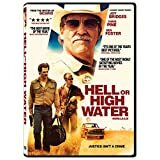 Posted on 17-05-01, in 4 Star, Movie Reviews and tagged Ben Foster, Chris Pine, Gil Birmingham, Hell or High Water, Jeff Bridges. Bookmark the permalink. 1 Comment.